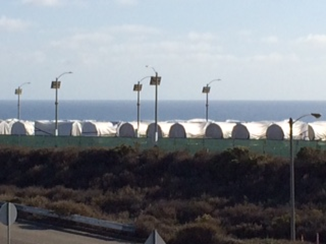 Deployment of the new beach-front Nuclear Waste Dump at San Onofre is imminent. Here are four good reasons why storing high-level radioactive nuclear waste on our public beaches is a bad idea. See the photos below. 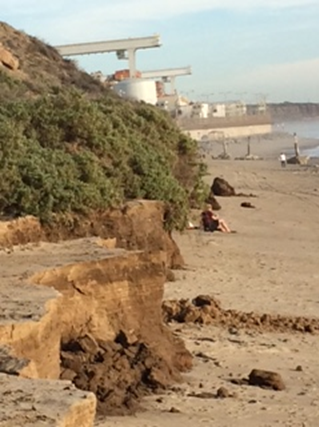 Beach-front erosion from the heavy “King Tides” that hammered the San Onofre shoreline in January of 2016. The current plan buries nuclear waste in casks located just 150 feet from the beach. The bottom of each cask will rest several inches above the water table. At this time, there is no plan to remove the casks, until the Year 2049. Southern California Edison is poised to turn San Onofre State Park into a beach-front nuclear waste dump in the next few weeks. The waste will remain at the beach for hundreds, perhaps even thousands of years. 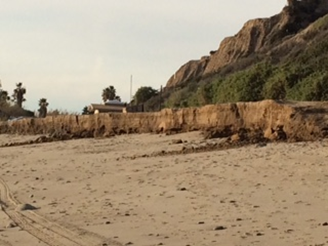 The California Coastal Commission Mission Statement reads: “The Commission is committed to protecting and enhancing California’s coast and ocean for present and future generations.” Yet curiously, on October 6, 2015, the Commission voted to issue a permit allowing the storage of Spent Nuclear Fuel (SNF) on the beach at San Onofre in the “early 2016.” Once the casks are buried, they are likely to remain on the beach for as few as two generations, and more probably for at least 160 years. Each cask will be stored inside a modular concrete tombs that carries a ten-year warranty. Repairs to the casks are impossible once they begin emitting radiation. What’s more, spent nuclear fuel is toxic to humans for more than a million years. Each of the 75 casks will contain more radioactive material than what was released at Chernobyl in 1986. The Coastal Commission’s Staff Recommendation urged immediate approval of the Southern California Edison nuclear waste dump (called an IFSI) by imposing tough-sounding special conditions that would ensure that the waste remains safe and transportable once a permanent storage site is found. In reality, the tough “special conditions” actually allow SCE to defer its compliance to existing NRC rules. Evidence that the fuel storage casks will remain in a physical condition sufficient to allow off-site transport, and a description of a maintenance and inspection program designed to ensure that the casks remain transportable for the full life of the amended project. An evaluation of the effects on visual resources of retaining the project, an analysis of available project alternatives and their implications for coastal visual resources, and proposed mitigation measures to minimize adverse impacts to coastal views. However, a careful reading of the Duration of Approval text reveals the most important safety measure (i.e. 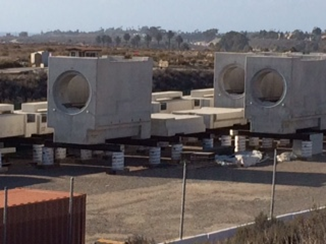 ensuring that the casks are transportable) isn’t enforced for twenty years when the temporary license for the San Onofre Nuclear Waste Dump is up for renewal. The introductory paragraph states that Southern California Edison (the Permittee) is not required to observe any of the tough-sounding special conditions until April 6, 2036. In other words, SCE has been granted a permit that does not require the containers to transportable now. SCE has successfully managed to to kick the portability can down the road for another twenty years. Nuclear Regulatory Commission (NRC) rules require that dry casks must be monitored by an Aging Management Plan (AMP). The purpose of the AMP is to ensure that canisters can be inspected for damages after they are buried. In summary, SCE’s intended aging management program would include (a) the monitoring of environmental conditions, such as temperature and humidity, that could influence the risk of corrosion and degradation of the stainless steel MPCs; (b) visual observation, surface measurements, and other inspection techniques to provide information on the physical condition of the MPCs; and (c) use of an empty cask (“coupon”) as a surrogate for filled casks to allow for more thorough inspection and evaluation. However, the “non-destructive examination techniques”, “remote surface inspection tools” and “NDE methods, employment methods, qualification processes and acceptance criteria” referenced by SCE are “in development”, and their utility for the maintenance and monitoring of the spent fuel casks has not been demonstrated. Nor is it clear when these techniques, tools and standards would become available for use at SONGS. The bottom line is that SCE’s only guarantee is a vague promise that an AMP is “ in development. ” What’s more, this “development” of inspection capability could take another 20 years. Again, the Coastal Commission created a tough-sounding requirement for SCE that may actually serve to delay SCE’s compliance with NRC rules. Namely, SCE must prove that is has the ability to maintain and monitor the canisters once they are buried. Most importantly, the Coastal Commission Staff has allowed SCE to get a permit based on a monitoring system that has yet to be invented. Specifically, examination of the Holtect canisters requires an “NDE” or non-destructive examination. At this time SCE has not invented a way to accomplish a non-destructive examination of its canisters. SCE’s program will focus on engineered controls (i.e., conservative design, material selection and fabrication controls), operational controls (e.g., inspection and monitoring) and developing mitigation plans to address material degradation and/or mitigate its consequences. Site monitoring of environmental parameters such as temperature and humidity will be used to help determine the risk of corrosion to the canister and predict the time of onset of degradation. Inspections will include visual observation, collection of surface deposits and temperature, and more extensive non-destructive examination (NDE) techniques. Industry efforts are well underway to develop NDE methods, deployment methods, qualification processes and acceptance criteria. It is not unusual for such efforts to evolve over time and with greater collective experience. With the commitment that SCE will not wait until it is required by the NRC to implement an AMP, SCE expects to be an early, if not the first, user of such techniques. One of the challenges of inspections is getting to the entire surface of the loaded canisters which have a radiation environment that limits access. Remote surface inspection tools are currently being developed and are expected to be available for use at SONGS shortly after the fuel is transferred to the expanded ISFSI. In addition to developing these remote inspection tools, SCE will place an empty canister in the same environment as the loaded systems. This type-test specimen (i.e., coupon) can be thoroughly inspected and monitored in ways that a loaded canister cannot due to the presence of a spent fuel assembly. SCE has selected a canister to test, which will be located in the vicinity of the proposed ISFSI pad and will begin its initial exposure by the fourth quarter of 2015. SCE’s AMP will include a combination of the inspections described above to monitor the condition of the ISFSI components throughout their service life. This will provide assurance that the ISFSI components are performing as designed and allow for the spent fuel to be safely removed when the DOE is ready to transfer the fuel to an interim storage facility or permanent repository. Plain English translation: SCE has no method for examining whether or not its canisters have been damaged by earthquakes, wave action, corrosion, or radioactive decay because the techniques to do so have not been invented yet. Second, SCE will deploy an empty surrogate canister called a “coupon” that it can examine in place of the fully-loaded buried canisters. But comparing the stress on an empty canister versus a full canister is a ridiculous form of quality control. According to the Storage and Transport Cask Data report, a Holtec canister filled with spent nuclear fuel can weigh between 287,000 and 480,000 pounds. Therefore, comparing the possibility of a stress fracture by using an empty cask is specious. As noted on page 3 of this document, Holtec, the manufacturer of the canisters has admitted that the casks are 100% non-repairable in the event of a microscopic crack which could leak “millions of curies” of deadly radiation. Of course SCE won’t know if there is microscopic cracking because it doesn’t have an Aging Management Plan in compliance with NRC rules! 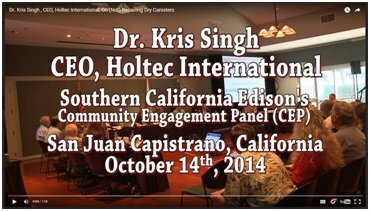 This is what Dr. Kris Singh, Holtec CEO said at a Community Engagement panel meeting (see video, page 3 of this document). A single curie = 3.70 x 10^10 disintegrations per sec. In today’s units 1 curie is about 30 Giga Becquerels, a death dealing dose of radiation.